We featured a lot of great articels in our latest issue #4 of Reeperbahn Festival Conference MAG. Immerse into it and discover articels of Cherie Hu, this year's winner of the International Music Journalism Award in the category Music Business Journalist of the Year, about mental health and wellbeing of creatives and non-creatives in the music industry by Rhian Jones, and exclusive interviews with Baris Basaran and Julia Ruzicka, both speakers at the 2017 Reeperbahn Festival Conference. Read more below. At this year’s Reeperbahn Festival Conference we proudly celebrated the very first International Music Journalism Award. The winner in the category “Best Music Business Journalist of the Year”, by quite a large margin, was American journalist Cherie Hu. Hu gave a very interesting interview about her perspective on the business and especially on the music business itself. 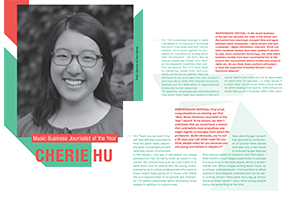 Go to article Cherie Hu - Music Business Journalist of the Year. ...is the title of a recent study conducted by London’s University of Westminster. It cites, among other things, financial worries, poor working conditions, and private relationships under pressure due to workrelated problems as detrimental aspects of working in the music business. Author Rhian Jones, and moderator of the 2017 Reeperbahn Festival Conference session Social Gap versus Value Gap, has taken up the topic of mental health issues and wellbeing of creatives and non-creatives in the music industry. 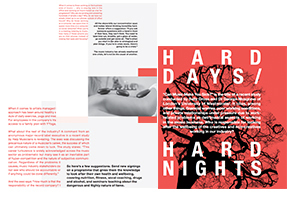 Go to article Hard Days/ Hard Nights. Baris Basaran (SSC Booking/ Head of Booking, DE) was a speaker at the 2017 Reeperbahn Festival Conference for the session Agent’s Agenda. 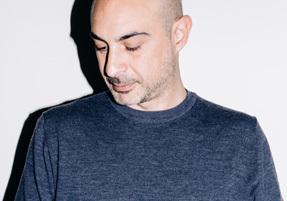 In an interview with Reeperbahn Festival Conference MAG Basaran opens up about important issues of the music and entertainment world and the development of music business in eastern Europe. Go to article "What's up, Baris Basaran?" Julia Ruzicka (Future of the Left Musician; Prescription Records /Owner, GB/AU) was a speaker at the 2017 Reeperbahn Festival Conference for the session “Hit the Fan – Rules of Engagement”. In an exclusive interview with Reeperbahn Festival Conference MAG Ruzicka describes her view of things regarding gender and sexual power issues, equality for women in the music business, and responsibilities. Go to article "What's up, Julia Ruzicka?" Reeperbahn Festival will take place 19 – 22 September, 2018. Take advantage of our Early Bird Offer and save up to 47% of the Regular Rate. Please be aware that the Early Bird Offer is only available until 31 December, 2017. ﻿Register here.